The Hotel Montefiore is a boutique hotel in the heart of Tel Aviv. The restaurant offers a blend of stylish atmosphere, top quality service and attention, with a fairly standard hotel menu for breakfast which include an Israeli-and continental-breakfast, omelettes, smoked salmon, cheeses and breads. The lunch/dinner menu is filled with clearly named dishes like sea bream & lemon grass cream, and sirloin burger & bone marrow which are likely simple plated dishes rich in flavour without over whelming the palate. We were told it was an excellent place to have breakfast/brunch, but we found nothing unusual or surprising on the menu. The food is of good quality, and the prices were in line with other restaurants in the area. It’s a sophisticated and fashionable place to have a dining experience. 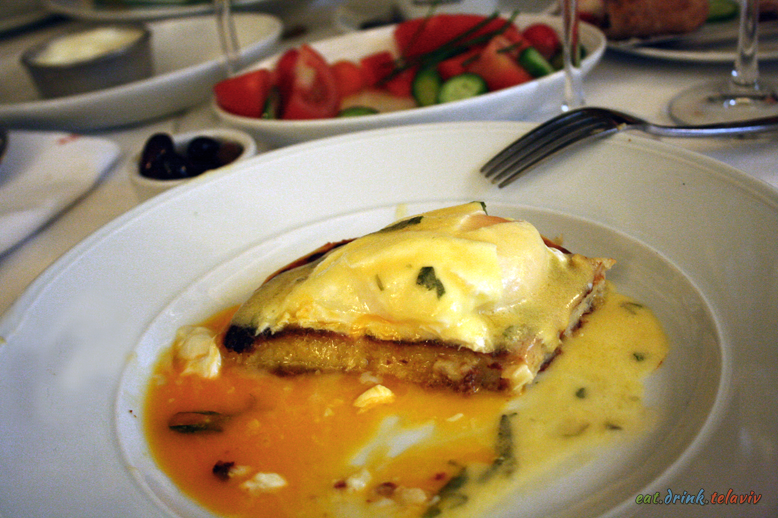 My friends had split a fairly standard Israeli breakfast which included and omelette with a small side salad of tomato and cucumbers, a small amount of cheese, olives and creamed cheese. I had initially ordered the Continental Breakfast of rolls, pastries, greek yogurt and fruit. 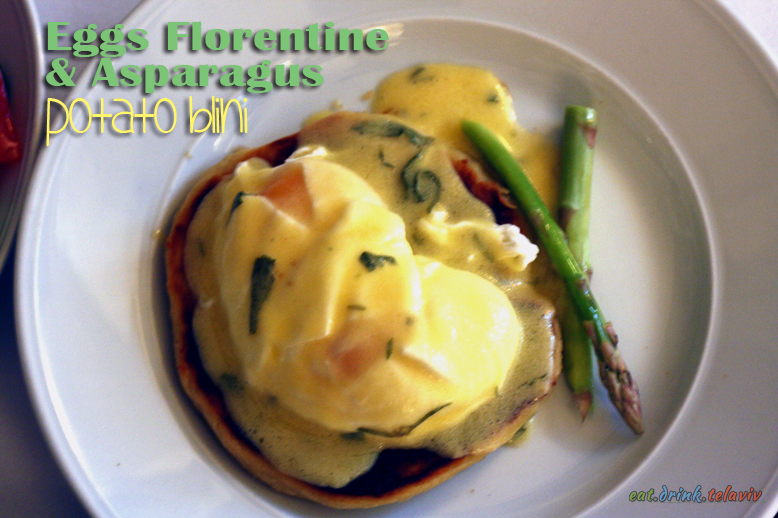 But upon catching an “off-menu” secret item of Blinis with poached eggs and asparagus I was able to make the switch. This dish is only available in the winter and on weekends. 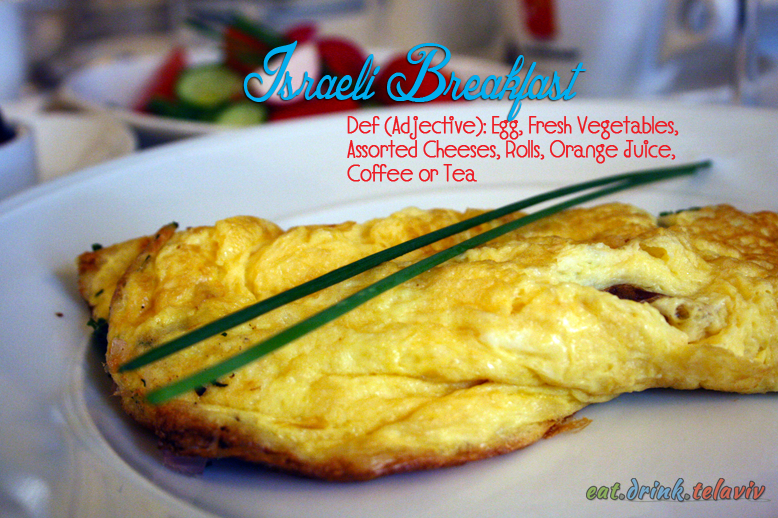 The Israeli breakfast was nothing unusual, and to those eating it, felt a little sparse. They commented that other places offer a bit more of the accompanying sides (a bit more cheese, a bit more variety.) 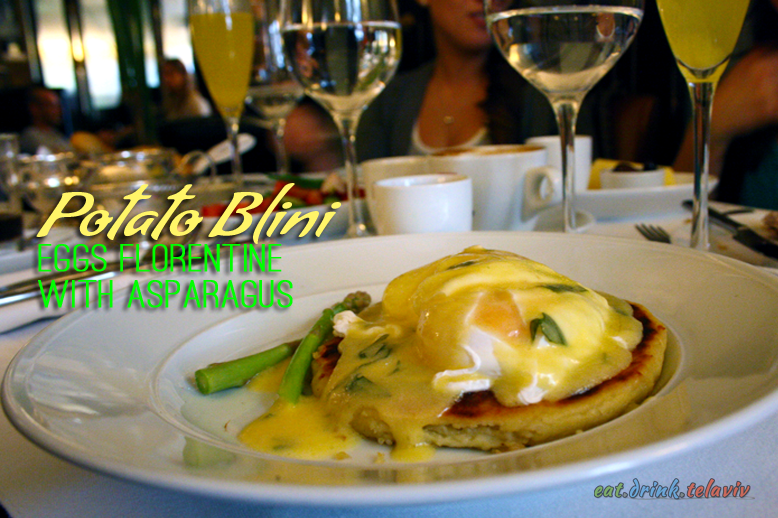 The Blinis, the warm potato pancakes with accompanying poached eggs and asparagus were a definite secret worth discovering, and in my opinion more exciting than a continental breakfast. 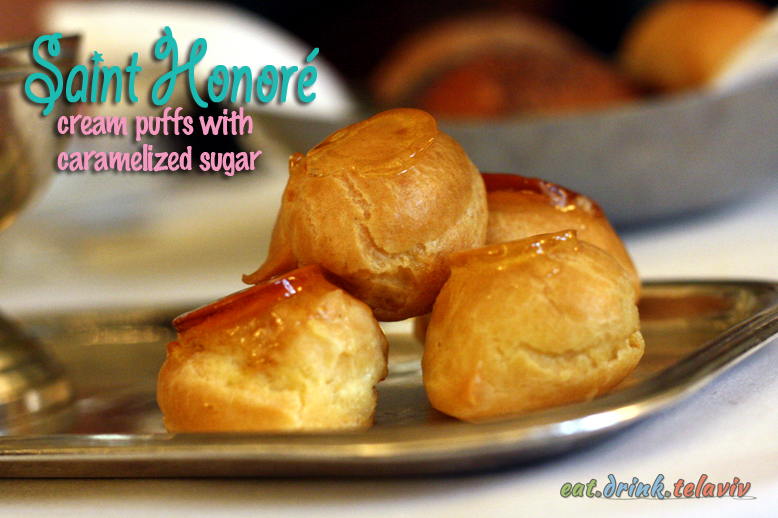 For dessert we ordered Saint Honoré (cream puffs). The server insisted they were the best dessert item on the menu. The cream puffs were a nice, bite sized way to enjoy the end of the meal. They were well balanced with just the right amount of fresh cream surrounded by light on the inside, crisp on the outside pastry, topped with caramelized sugar. The Hotel Montefiore is a great place for older tourists, business people, and traveling couples looking for a fancy, sophisticated place to dine. 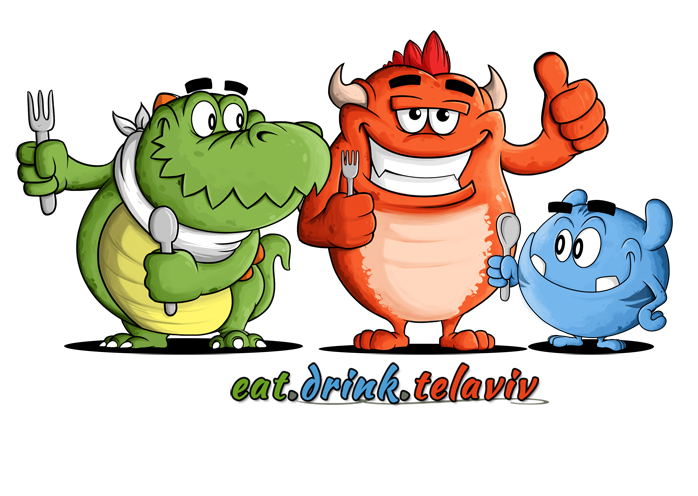 For those in Israel, the restaurant offers a nice stay-cation venue if you are looking to step away from the standard Tel Aviv, Israel atmosphere. It has been noted that the dining experience can be a bit noisy which was our experience, but Hotel Montefiore is comfortable and inviting as any hotel should be. While waiting for our table, free mimosas made the rounds, which is a nice touch on the weekends. Being part of the R&M group of restaurants (Brasserie, Cafe 12, Delicatessen, Coffee Bar) you should expect and receive incredibly attentive service. 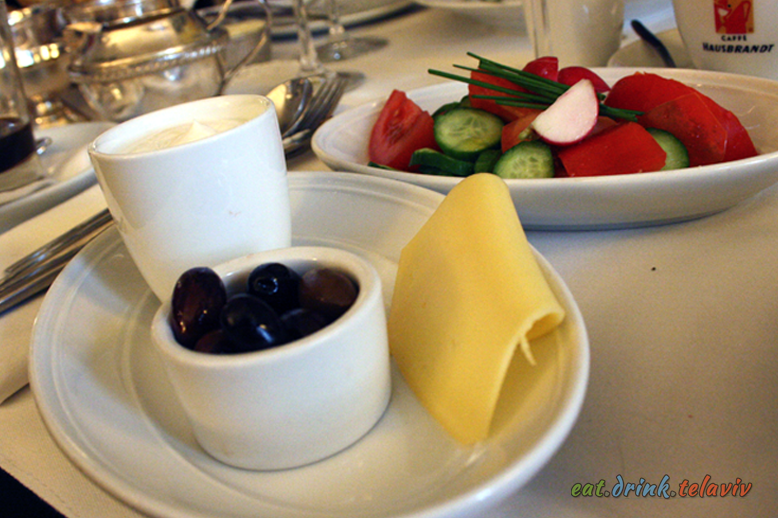 Hotel Montefiore’s Israeli breakfast, one of the three breakfast combinations available. Professor NomNom: I like this, but it’s just more my style. Of course this is coming from someone that had two goldfish named Pomp and Circumstance. Captain Blarg: This is maybe a place I’d take my wife for an anniversary, if we decided to have a watchucall’em? A stay-cation? Maybe treat my wife to a night at the hotel and then go here. The bar looked nice but I wouldn’t bring my soldiers to relax here. NomNom: Completely. However service was impeccable, and the dishes were served clean. Blarg: I agree, food seemed good, and I like more open spaces. Seemed stuffy. I am making the effort to visit as many places for breakfast/brunch in Tel Aviv as I possibly can in hopes of crafting a top five. It’s become a standing order among my friends that brunch is always an option so I’m doing the best I can. The challenge lies in the variety of venues available. Since they are so different how can one truly be objective? And what criteria do you base that assessment? Hotel Montefiore, for me, was a bit of a conundrum. I like breakfast places to be a little more laid back, airy and not so formal. On the other hand, I really think service and quality of food is paramount. When one enters the Hotel Montefiore, Tel Aviv, you are presented with a very refined decor, black wood, shiny white marble floors. The well dressed hotel staff and restaurant host greets you with a smile and a “Do you have a reservation?” Very formal, very sophisticated. And that is why I would recommend it to older couples, elderly travellers looking for style, and a little pampering. It’s the kind of place even a younger couple would go as a treat to themselves, or a group of ladies on a special birthday (as I witnessed the table beside me, while I ate.) But I found the place a bit… pretentious and very much not my scene. The R&M group are incredible at offering a high quality experience as their attention to detail and service is remarkable. 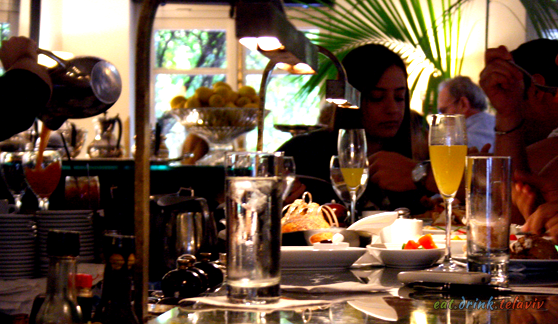 However, that aside, sometimes brunch is just brunch and not an invitation to the Ball. I’m grabbing brunch with my American friend Shira and a fellow compatriot Canadian Andrea. We chance not making a reservation only because we did not think you could. You can, and you should. We end up waiting about 40 minutes for a table, which isn’t so bad given the circumstances. Also, as previously mentioned how R&M Group understand service, while we waited we were treated to complimentary mimosas. Andrea and Shira revel in this detail, even though Andrea is feeling a bit under the weather and barely sips from her champagne flute. I, on the other hand, don’t drink it at all. I’m suspicious of this whole “mimosa” concept. Orange juice and champagne in the morning hours? Sounds like veiled alcoholism. Someone discovered the perfect way to camouflage their need for booze early in the morning. It was almost as brilliant as the person who invented the muffin – which is basically cake for breakfast. And it worked. Cake in the morning and alcohol for everyone at brunch! 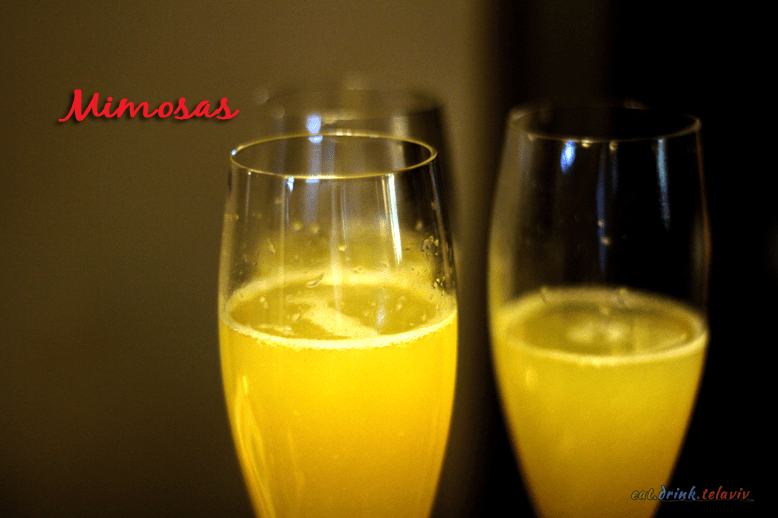 In fact some places I’ve been to in the United States offer all you can drink mimosas. I asked Shira if she had been to one of these places but she just giggled, mumbled something incoherent and began wondering around the lobby. Great… it’s 12 o’clock in the afternoon and someone is already drunk. We are seated at a very nice table, elegant, and well set; white table cloth, wine glasses and two perfectly placed salt and pepper shakers. Our server realizes we don’t speak Hebrew, so she speaks to us in English. I tell her I don’t mind if she speaks Hebrew to me, and she laughs politely and says “it’s okay.” (Is it? Is it really?) She is half-American, from New York, or Florida or Mexico. I don’t really remember because I wasn’t listening–I’m still wondering why she won’t speak Hebrew to us? And here is where you see the difference between Canadians and Americans. My friend Andrea, who stands on guard for thee, says it’s too late. Accept the fact that I just ordered orange juice, a couple of rolls and some jam to smear. Maybe I can use one of the pastries to wipe away my tears. Shira “I’m from New Jersey, I say Water in a funny way” tells me it’s not too late, and even if I am served the dish I ordered I can tell them to send it back and bring me something new. The servers at Hotel Montefiore Restaurant in Tel Aviv are very attentive so it was no trouble flagging her down politely. Mustering up all the Canadian in me but still persevering through that politeness I ask her if she could so kindly change my meal if was okay with her, the chef and anyone involved in taking down my bitty order of a Continental breakfast. I tell her to check with management as well, I don’t want to cause any trouble. Andrea is holding her breath, Shira is rolling her eyes (is she still drunk?). I’m wondering to myself if the Continental Breakfast comes with donuts, maybe if I’m stuck with that it might not be so bad. Every Canadian loves a good donut. The server smiles and says it shouldn’t be a problem. (Go America!) And thankfully I enjoyed the Blinis and eggs. The pancake was warm and satisfying, with a smooth texture throughout. Very different from a potato latke. And the eggs were poached to perfection. Shira and Andrea weren’t so positive about their Israeli breakfast. 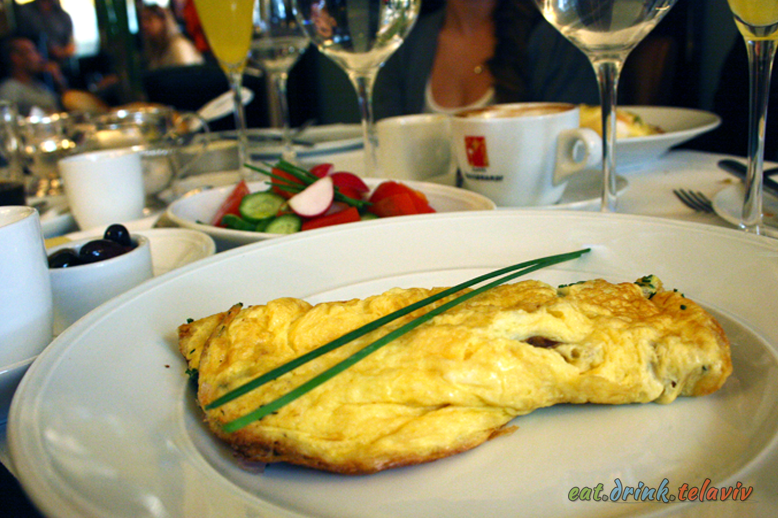 The egg was done fine, but in my opinion it seems sad to receive an omelette on a plate just like that, with the accoutrements handed separately. It’s like when the kitchen was making the eggs, they felt it didn’t allow any of its food-friends to share the space. 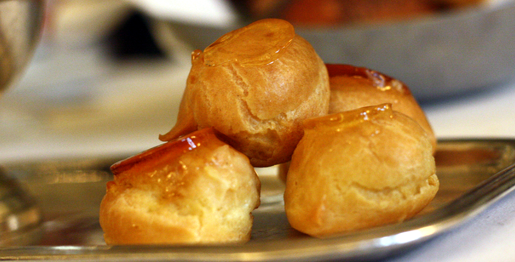 For dessert the Saint Honore cream puffs were recommended by the server. She says they are the most popular dessert, and they seemed different and unique a menu item, it seemed worth trying. 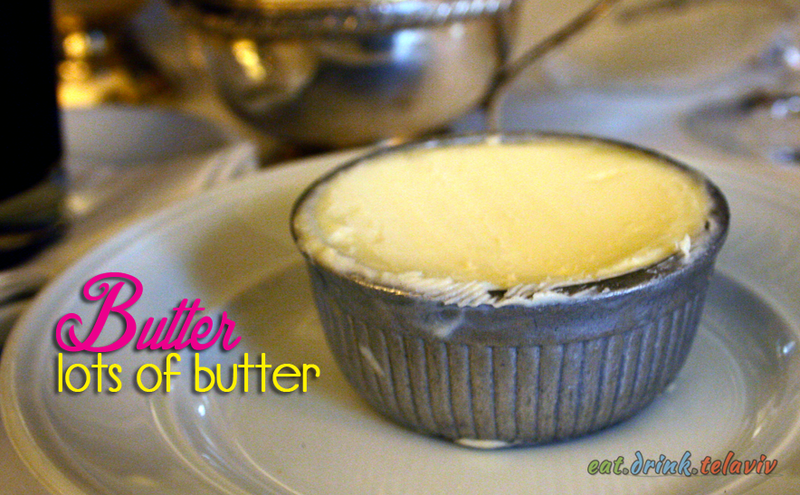 They were delicate, bursting with custard, and a sweet topping of caramelized sugar on top. The four pieces where just enough for the three of us to feel satisfied after brunch. Overall, Hotel Montefiore, Tel Aviv is an excellent place to escape to a very posh atmosphere with a standard and consistent menu that could probably use a rewrite to excite the senses. Items are simply explained eg Toasted Hallah Bread, Smoke Salmon. Or Mussels, Lime, Lemongrass. You aren’t invited into imagining a dish so much as just reading a grocery list. The Blinis were a saving grace, but without prior knowledge of the secret (winter and weekend only) item you might end up with a basket of pastries and a Continental breakfast, especially if you are Canadian. And sadly it does not come with any donuts. Which would have been pretty awesome eh?